Bricks are foremost for the construction industries, that requires to carry carefully and efficiently in order to improve construction efficiency of the respective and to which our conveyor belt for brick is the best bet, manufactured with the highest concentration on to fix the never ending issues associated with those are abrasion and wear. The offered conveyor belt for brick is an exemplary combination of the PVC/PU material and the hot vulcanization technology enabling us to reap the high abrasion resistance and wear resistance properties of the material, whereas the reinforcement ability of the vulcanization and therefore the finished product strongly meets the need of the bricks conveying need and being the best performer in the market. The offered conveyor belt for brick is engineered as per the international quality regulation to achieve a range that can be used blindly without the agony of the safety and reliability. Our conveyor belt for bricks is ideal to use under any weather conditions and that we have ensured, by under passing the severe quality tests ahead of introducing in the market, and therefore is ideal to operate under any conditions. 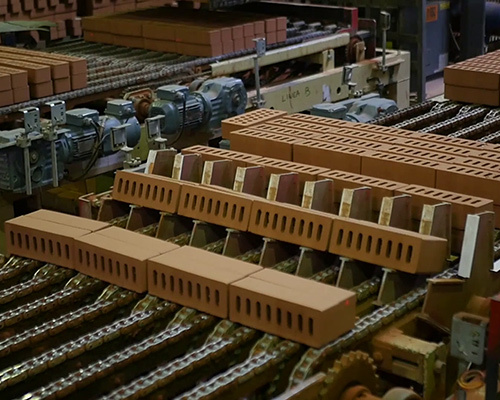 The shock absorbing characteristic of the offered conveyor belt prevents the falling of the bricks due to the vibration and the rough top of the conveyor belt equips notable grip to convey bricks at the steeple angles. This brick conveyor belt is a cost effective approach that increases the productivity, reduces the manned requirement and possibilities of accidents and therefore has become the indispensable part of the construction indsutry.